While I consider myself to be very girly I don't have a lot of pink in my wardrobe, accessories or really anything in my life. Recently I have become so drawn to pink, including a serious hunt for a bright pink bag that has been eluding me for months now!! Side note - did you know yesterday was National Pink Day?! via Here's what I've got my eye on! Bite Beauty Lip Pencil || I love their lip pencils because not only are they highly pigmented, but the color stays on for a long time. I'm torn between Corvina and Bouquet which is a lighter pink. Avery Crossbody || This color must be popular because it's sold out everywhere except for on Rebecca Minkoff's actual site. I think the bag would actually be great because the last thing is I need is another large tote and the size of this one is perfect! While perusing the website I also found this incredibly fun fringe cross body and I'm right back to square one! Flamingo Blouse || Zelle posted this fun blouse on Monday and I've been obsessed ever since! I can see it paired with jeans, white pants or even a pencil skirt for work! The possibilities are endless and for this reason I think it would be a great purchase. Pink Sneakers || These are definitely not training shoes, but more so for light training or even great for travel when you're going to be doing a lot of walking! You really can't beat the price for under $30!! Pink Blazer || I have a light pink blazer that I've worn to work a few times, but it's a bit more casual and probably wont last more than one season, but this tweed blazer is perfect for work and would look great paired with jeans! Another piece that I think I'll get a lot of wear out of! Cedar Street Wallet || If I don't end up getting a pink bag, the least I can do is look into my purse and see a bright pink wallet!! I love big wallets and this Kate Spade one wraps around which is always a perk. What's your current color crush? 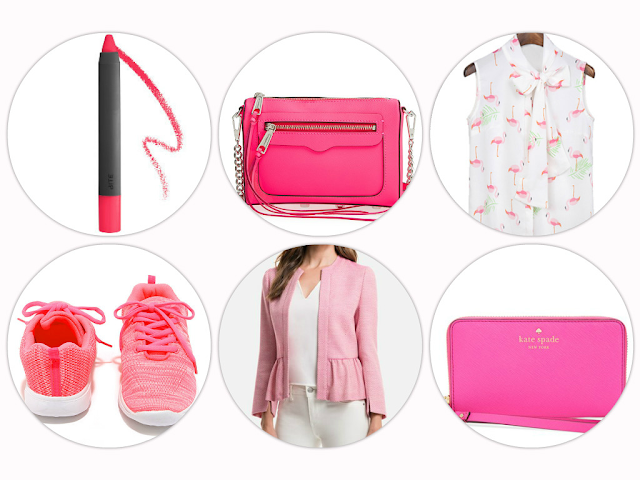 Loving all of your pink-spiration! I dont have a lot of pink in my wardrobe either but I love fun pops of pink! That pink bag is amazing!! I love that bright pink Kate Spade clutch. It's the perfect bright color for the season! There is nothing better than pink! I totally missed the memo on National Pink Day, I found out late yesterday and was so disappointed I missed it! I love all your pink inspiration but those pink sneakers are so cute! Happy Wednesday! Alwaaaaays love a pop of pink! I'm defiantly not into pink like I used to be (aka obsessed), but I do still love the color! I keep seeing that flamingo blouse and for good reason! It's adorable. Those pink sneakers look perfect for running errands or short walks. LOVE that Kate Spade wallet! I don't have much pink either but I feel so "girly" and "pretty" when I wear something with a pop of pink! I have never really been a pink girl either. 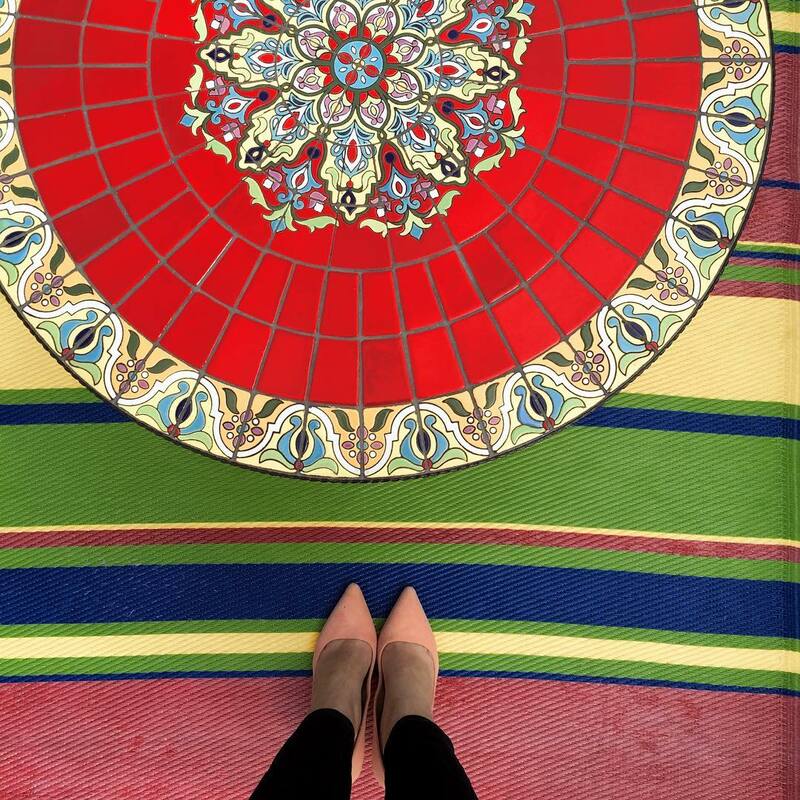 Love your inspiration pieces. 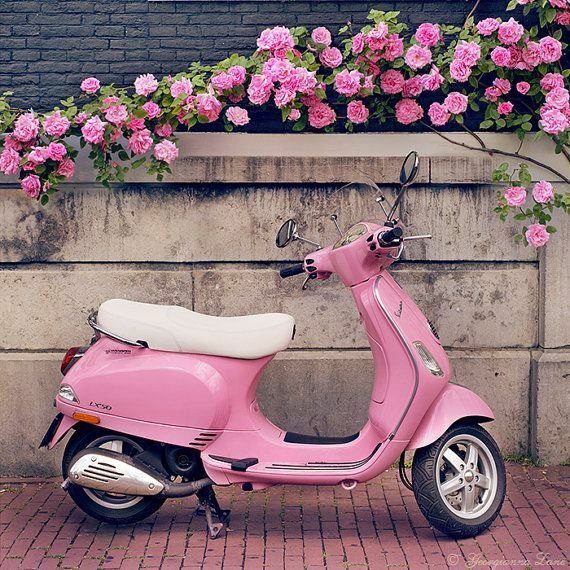 The little pink moped is too cute. You know me and pink, just can't get enough of it! I was bummed I missed the mark on national pink day and didn't go all pinked out. But, that's okay, your list has me looking at more pink pops for my wardrobe. Embrace the pink, ladies! I love a good hot pink piece! Bite pencils are my favorite-- love the colors you picked! Love that clutch! And the dresser from the inspiration.. I'm dying! I love pink and own a ton of it. My hubs painted our bathroom pale pink and I have Kate spade chinawith a hot pink rim. The list goes on! Get yourself some pink girl! I have always been a big fan of pink it was even the bridesmaids color in my wedding. I am starting to see more and more of it out in the stores! Woo hoo because I love it and with your skin color and beautiful dark hair I bet you look gorgeous in pink!! I do that with colors all the time. I'm not usually drawn to pink either but I love those inspiration pieces. Good luck finding your bag! Give me all of the pink! I'm a total sucker for tweed jackets and I NEED that pink one, great find!! The only thing I could think of while reading this post is " On Wednesday's we wear pink!" Love this post! I've mentioned a few times on my page of my love for Paris, so you already won my heart with that! lol I thought my favorite would be the Kate Spade bag (I'm a huge Kate Spade fan), but that blazer really is my favorite. I'm not a huge blazer person, but I love the color and the peplum shape! I totally need that flamingo top! I need that flamingo shirt in my life!!! I'm definitely picturing it with white jeans and camel colored wedges! Ugh! And I love a bright wallet. That Kate Spade one is gorgeous. I totally had no idea that yesterday was National Pink Day! I should have know that since my favorite color is pink. lol. I love your pinkspiration!! It's such a great color. You totally need a pink purse!! I've always been a pink girl, I just don't wear it as much as I should. 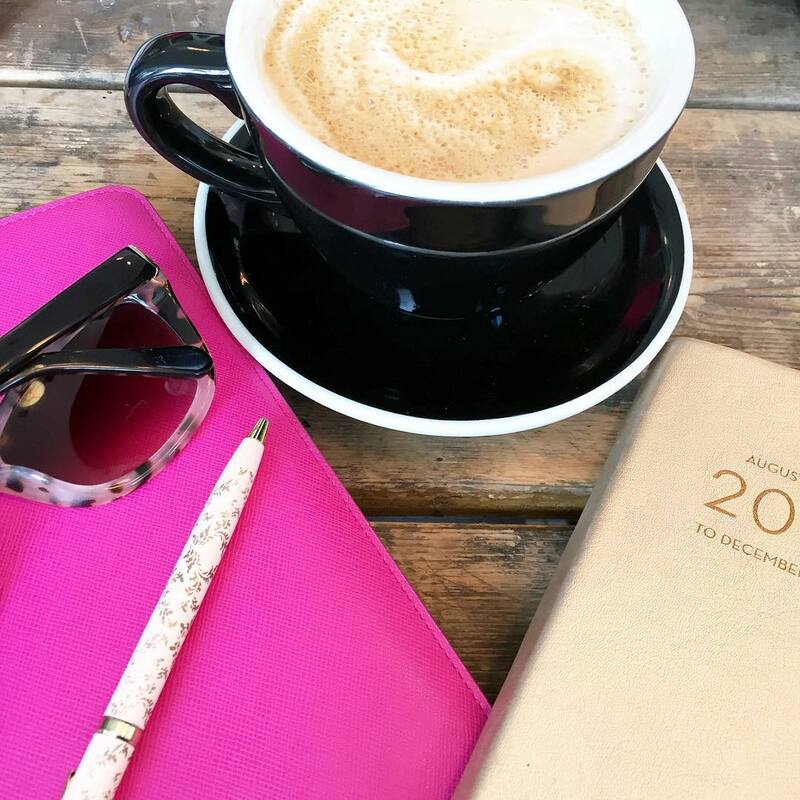 This is such a pretty post and it's giving me inspiration to go and buy a lot of pink! I have a major color crush on pink! Absolutely loving that pink blazer! I've been loving pink for Summer even though I don't own much! In love with that flamingo top!! I've always loved a good pop of pink! If my husband would ever let me get away with having an accent piece like that pink side board, I'd be allllllllllll over it. 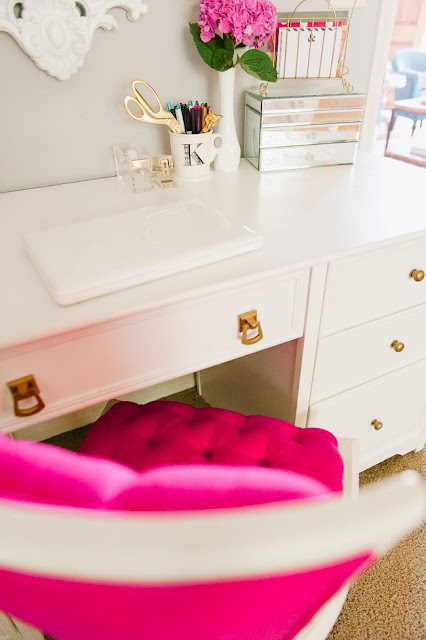 One day, I'm going to have a girly room just for me that has something like that in it. One day. I've always loved pink too and really love it on blondes! But I don't own a ton of pink, I mostly stick to blues! That flamingo blouse is precious! 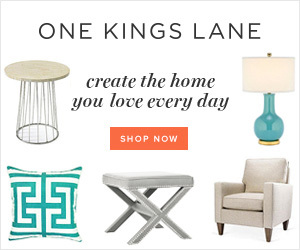 Girl, I am obsessed with pink so I'm LOVING all of your finds!! How did I miss the fact that yesterday was national Pink day? Ugh! But yes, once my wedding is over (IE I can finally splurge on myself) I am so buying a timeless pink bag. Pink never goes out of style! I had a feeling something like this was coming based on all your recent pins! I love pink, too and have been on the quest for a pink bathing suit! I finally ordered one yesterday, so hopefully it fits. That Flamingo blouse thatZelle has is so adorable - you could totally rock it! I know what you mean. I love pink but don't own a lot of it either. It's always a great pop color though for any summer outfit and I am loving the Kate Spade wallet! Loveeee the fringe bag and that blazer is too cute! So perfect for work or out with white jeans! I seriously love pink. I don't think I've ever grown up haha. That flamingo blouse is perfection! I wont lie--I am such a cliche girly girl--and pink is my go to color!! I am have totally been eyeing that pink flamingo shirt since I saw Zelle wear it on her blog!! I saw all of the pink on social media yesterday too! I've been eyeing that Kate Spade wallet as well. I also want the Kendra Scott pink Danielle earrings...I need to break down and buy them. That cross body purse is perfection! I love how simple it looks, but still has such a pop! That flamingo blouse is the cutest thing! How fun is it that's there's a day dedicated to pink? :) I'm loving those cute neon sneakers! I LOVE the flamingo blouse! The blazer is great too. I love pink but do not have any in my closet either. I just looked at that Kate Spade wallet yesterday. I'm debating the purchase. its so beautiful. 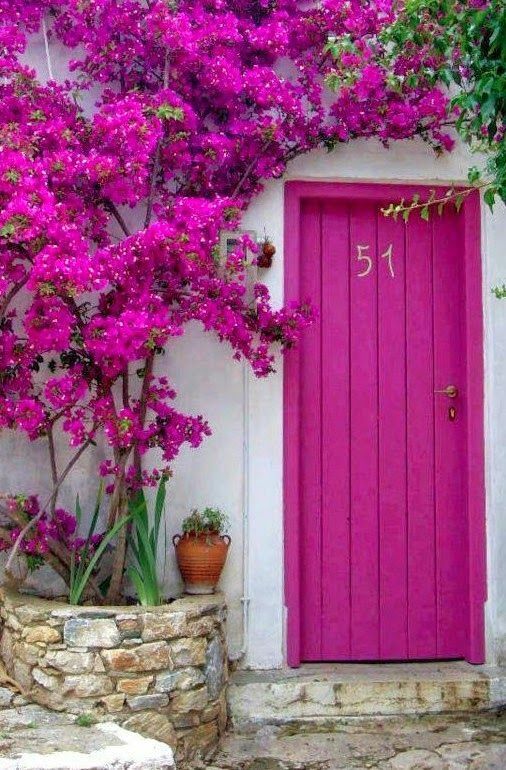 How appropriate to talk about pink on a Wednesday :) I love pink!!! My favorite color is purple, closely followed by pink. That blouse is so fun for summer and I too would love a pink bag! I have an older pink signature coach bag...but I want a leather one now. Not like I needed anymore reason to love pink, but YES to this entire post! Hot pink is one of my favorites for sure and I'm absolutely dying over that flamingo blouse - how perfect!! I love all things pink and love the pops of pink you picked, that KS wallet is so cute and a fun way to add a pop of pink to any color bag!! National Pink Day???! How did I not know??? I love pink! 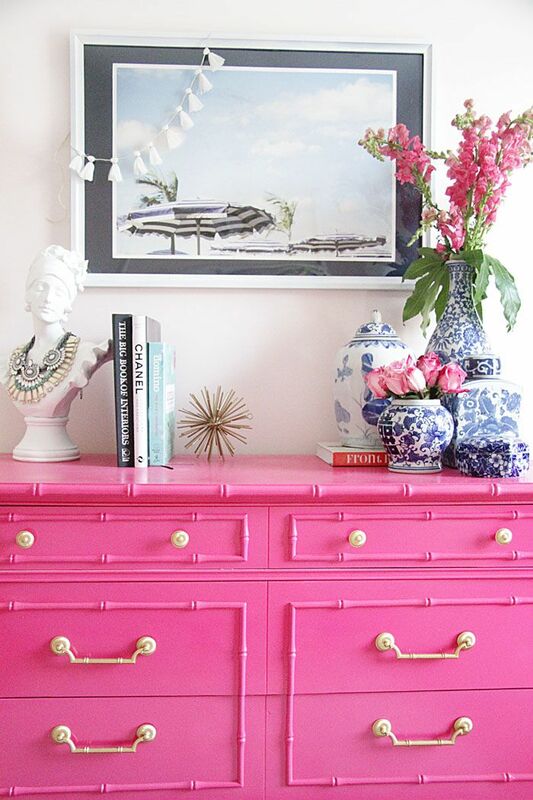 I love that pink bamboo dresser pictured above and yes, you definitely need a bright pink bag! I'm lovin' this post! I myself is obsessed with pink too and I'm so sad that I was apparently out of it yesterday and didn't find out until midnight it was national pink day, missed out! My color crush is definitely pink, and I don't see that changing anytime soon. Turquoise though is starting to be a very eye pleasing color for me, much like mint was a couple seasons ago. I waited 3 or 4 years to buy a bright magenta pink coach purse, and it didn't take long for those to sell out when I went back to get a matching wallet but I found a wristlet on ebay that works just fine so I'll be happy until they bring it out again in a few years. Good luck finding your perfect one!! How cute is that pink blazer?! 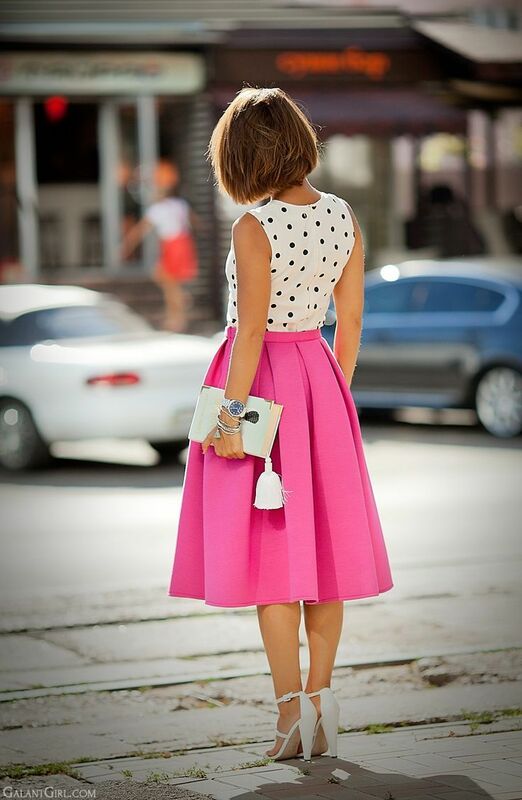 Loving this girly inspiration! Bright pink is having such a moment! I love that Minkoff - you should definitely get it, it would make such a fun statement with any outfit! I love pink too!! Love the wallet and cross body- soooo pretty! I'm on the pink train. I bought two pairs of pink sneakers recently and my nails are a deep rosy pink for vacation! I'm totally the same. I love pink, but I lack it in my wardrobe. I think it's because pink is difficult to wear with my skin. I have really red undertones and sometimes pink can enhance that. Basically I always look sun burnt even when I'm not. (; Love these ideas! Happy pink day! I love Bite Lip Pencils! They're so great. Also, that pink blazer is perfect & that Kate Spade wallet is fantastic! I wonder why the Eiffel Tower was lit up in pink? I'd love to see that! Love that top! I'm a fan of anything pink, but I don't think I own any pink clothes! Love love love all the pink! Eyeing that wallet! Seriously LOVE! Ooo so pretty! I don't have a ton of pink in my wardrobe but I like having pops of pink now and then! Especially paired with navy blue for summer! LOVE the flamingo top! I have that pink Kate Spade wallet and it's my favorite, plus everyone always asks about it when they see it! That's probably the only bright pink thing I own though! 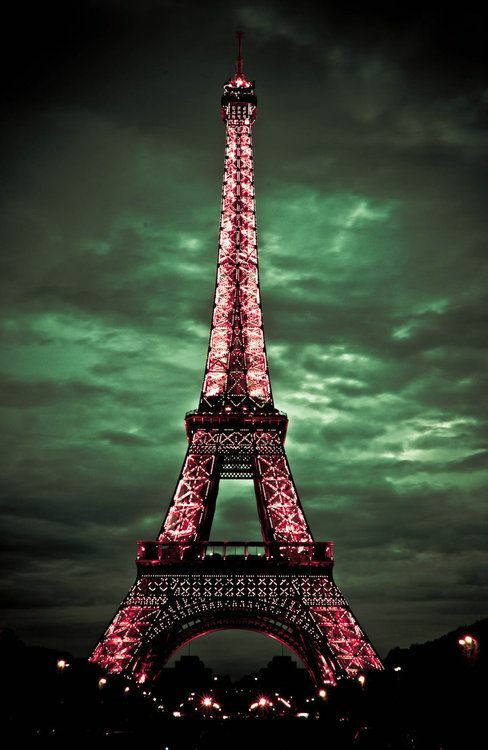 I love all of your pinkspiration photos, especially the Eiffel Tower! It's definitely a hot colour this season. I am seeing it everywhere and loving it! I am obsessed with pink right now too! I love your inspiration especially the house! I wish my husband would go for that. Also loving the flamingo top! i love pink and wish i had more of it in my life, minus all my makeup, hehe. love what you chose and totally forgot it was national pink day the other day! 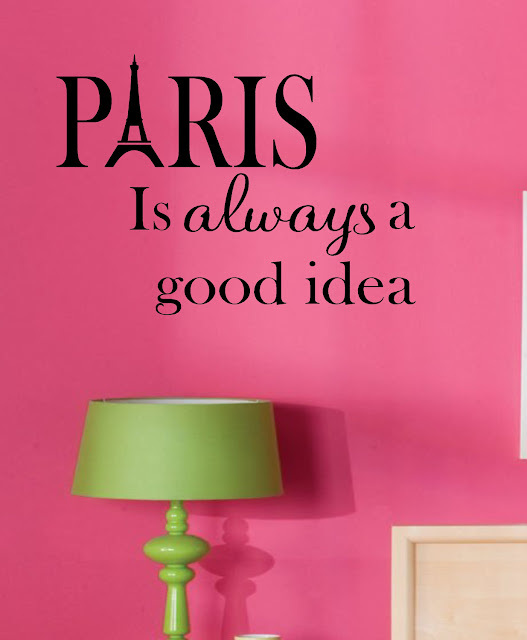 Two of my favorite things: Paris and the color pink! Great photos! I'm the same way! I love pink but never seem to buy it for myself. I love that pink dresser though. Now I'm wondering what I can paint pink! I've been loving pink this summer too- especially in clothing, which I'm never drawn to, but it's so fun and girly and usually pretty flattering I think. That pink dresser is so pretty and I love that pink skirt too! i don't own a lot of pink - i don't think it's really my colour, you know? like anything bright haha. but that flamingo blouse is adorable! and that bag, swoon.